More Evidence Apple's Looking Beyond Google for iPhone Maps? A few months ago, Apple bought their own mapmaker, Placebase, which seemingly opened the possibility of non-Google-y maps. 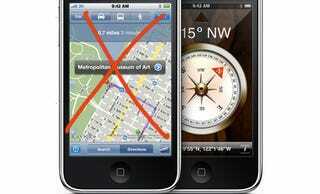 Now, they're looking for an iPhone maps engineer to "rethink how users use Maps and change the way people find things." The iPhone has revolutionized the mobile industry and has changed people's lives and we want to continue to do so. We want to take Maps to the next level, rethink how users use Maps and change the way people find things. We want to do this in a seamless, highly interactive and enjoyable way. We've only just started. As an engineer on the Maps team, your responsibilities will range from implementing low-level client/server code to implementing high-level user interfaces. You'll be responsible for implementing new and innovative features, fixing problems and enhancing the performance of Maps. You will work closely with the other engineers on the Maps team, other iPhone and iPod touch teams as well our partners in other companies.